Compare iRobot Roomba 980 vs. ILIFE A8 Vacuuming Robots: What Are The Main Differences? iRobot and ILIFE are two of the most important vacuuming robot manufacturing companies today, and both companies make a number of robot models offering various features ranging from the most basic to the most sophisticated. iRobot's Roomba 980 and ILIFE A8 belong no doubt to the top level vacuuming robots each company offers, and they are two of the very few robots available today that can resume by themselves the vacuuming job exactly where it gets interrupted after the robot returns to its docking station to recharge. This means that both robots are able to clean very large areas with almost no human intervention! This article will compare in the detail the features of Roomba 980 and ILIFE A8 vacuuming robots. 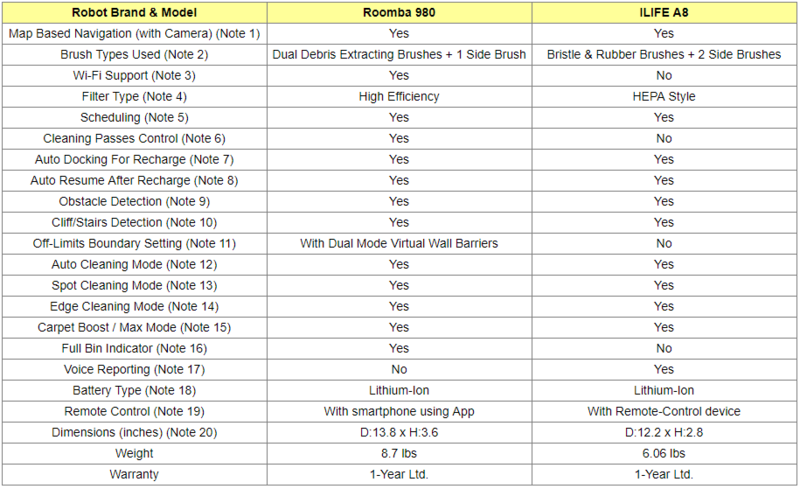 ​The following table compares the ROOMBA 980 and ILIFE A8 robots . 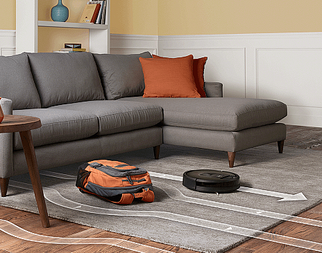 Roomba 980 features a visual localization camera used to map out your home in order to ensure complete coverage. It allows the robot to seamlessly and efficiently navigate an entire level of your home and keep track of its location. ILIFE A8 uses a live-vision camera to scan the rooms and create a panoramic map of its surroundings. Using the map, it computes a systematic and efficient cleaning pattern that avoids redoing or skipping any areas. This is the groundbreaking PanoView navigation that uses the advanced CV-SLAM graphics algorithm that helps the robot to map the floors rapidly and more precisely. Both robots can be used effectively on both bare floors (tile, hard wood, laminate) and low pile carpets. Roomba 980 comes with the AeroForce vacuuming technology which uses counter-rotating dual multi-surface tangle-free brushes (also known as debris extractors) that grab and break down debris eliminating hair tangles and jams. It is also equipped with a single side brush that cleans along wall edges. ​Finally, a powerful AeroForce airflow accelerator creates a sealed channel that concentrates the airflow, sucking in more debris, dirt and hair and directs it all into the dustbin. A8 comes both with a bristle brush and a rubber brush that can be interchangeably used. Though both type of brushes can be used on all type of floors, the bristle brush is best for carpets, while the rubber brush is best for hard floors and pet hair. A8 is also equipped with two side brushes that effectively gather dirt and debris at corners and edges. Finally, a powerful ILIFE Gen 3 CyclonePower suction system vacuums all collected dirt and debris into the dustbin. With Roomba 980, when the robot is connected via Wi-Fi to your smartphone, you can use the associated free App to invoke remotely the various operations available, such as scheduling and operating the robot, viewing the status of cleaning jobs, and customizing your cleaning preferences. Note that Roomba 980 is also compatible with Amazon Alexa, so it can be controlled with vocal commands. Simply ask Alexa to start, stop, or dock your robot​. Roomba 980 is equipped with an AeroForce High Efficiency filter which can remove particles and allergens as small as 10 micron. ILIFE A8 is equipped with a primary filter and a HEPA style filter. - The primary filter traps coarser dust particles, pet hair or any other type of hair in the dust box. ​- HEPA stands for "High Efficiency Prticulate Air" and is a filter grade defined by the US Department of Energy which requires the filter to be able to remove more than 99.97% of allergens, pollen and particles as small as 0.3 micron. Both robots allow you to schedule the vacuuming at specific times every day of the week. You will need to use the robot's associated Android or iOS App for scheduling. Most vacuuming robots will remove dirt and debris with just one pass over each area of your home. With Roomba 980, two-pass cleaning can be requested and can be particularly helpful in homes with pets or simply for periodic deep cleaning. The number of cleaning passes is one by default. When batteries run low, both robots considered here return to their docking station and recharge. ​Note that, both robots are able to resume automatically the cleaning job where it was interrupted before going to the docking station to recharge. They continue this way until the job is done and the whole level of your home is cleaned! Most vacuuming robots need to be restarted after they recharge themselves at their docking station (unless of course they had been previously scheduled to restart at a later time). But Roomba 980 and ILIFE A8 are able to resume automatically the cleaning job where it was interrupted before going to their docking station to recharge. They continue this way until the job is done and the entire level of your home is cleaned! Both robots are equipped with sensors that detect obstacles and try to avoid them to protect your furniture. Both robots are equipped with sensors that detect stairs. When they detect stairs, they slow down and select a new path. When automatic cleaning is invoked, both robots considered here will use the navigation and vacuuming methodes described above (in Notes 1 & 2) to automatically perform the vacuuiming job, intelligently covering and effectively cleaning the targeted space. Auto cleaning can be invoked by pressing the appropriate button on the robots. 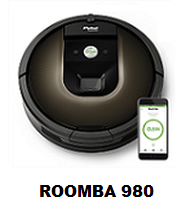 For Roomba 980, it can also be invoked from your smartphone via the associated iOS or Android app. For ILIFE A8, it can be invoked using the remote-control device. Both robots considered here can be asked to do a spot clean for very dirty places. Spot mode easily handles floors with heavy dirt or hair. For Roomba 980, spot clean can be invoked either by pressing the spot clean button on the robot itself, or from your smartphone via the associated iOS or Android app. For ILIFE A8, it can be invoked using the remote-control device. Though Roomba 980 is equipped with a side brush to clean wall edges, it also features selectable special final edge cleaning action to make sure that stubborn dirt and debris along wall edges are all removed. After the robot finishes cleaning the open areas of your floor, it will use the final edge clean feature to ensure that it has cleaned along walls and around furniture legs. With Roomba 980, final edge clean can be invoked from your smartphone via the associated iOS or Android app. If you prefer a quicker clean, you can disable final edge clean using the App. Note that the final edge clean feature is turned on by default. 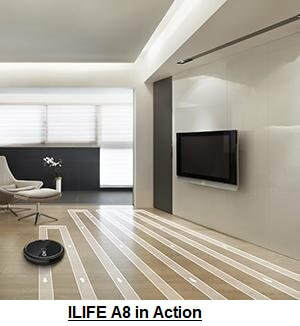 ILIFE A8 can also be asked to do an edge clean which makes the robot clean intensely along walls and corners. Edge cleaning can be invoked using the remote-control device. When on carpet, thanks to the carpet boost feature, Roomba 980 automatically increases its vacuum power to provide a deeper clean. ​The suction power of ILIFE A8 can be increased by selecting the max mode to enjoy a super-powered clean with maximum pickup. Max mode cleaning can be invoked using the remote-control device. Though ILIFE A8 does not have a full bin indicator, for the average size home, the bin is large enough (about 10 oz) to handle a complete cleaning cycle without having to empty it more than once. Both Roomba 980 and ILIFE A8 are equipped with are equipped with a high capacity rechargeable Lithium-Ion battery battery. Note that Lithium-Ion batteries are designed to provide longer cleaning sessions than other battery types such as Nickel Metal Hydride (Ni-MH), and they last longer before needing to be replaced. The run time for Roomba 980 before it goes back to recharge is about 120 minutes and for ILIFE A8 it's about 90 minutes. Roomba 980 can be remotely controlled from your smartphone or tablet using the associated free App to schedule the robot, to invoke the various run modes, to send the robot to the docking station, etc. No explicit remote-control device is provided. 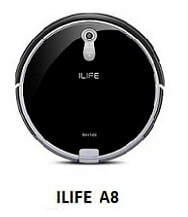 ILIFE A8 comes with a remote-control device that can be used to schedule the robot, to invoke the various run modes, such as auto clean, spot clean and edge clean, to send the robot to the docking station, etc. ​​The "D" in the dimensions refers to the diameter, and "H" to the height of the unit. All measurements are in inches. As the above comparison table shows, Roomba 980 and ILIFE A8 robots are quite similar with respect to some of the basic must-have features such as mapping out the space to be vacuumed to ensure complete coverage, avoiding stairs and obstacles, scheduling, auto recharging and resuming the job where it was interrupted after an auto-recharge. However, the two robots are by no means identical, and each offers a number of exclusive features. Therefore, we suggest you carefully study the above table and clarification notes before you decide which robot will best respond to your needs. It supports Wi-Fi, and therefore, it can be controlled using your smartphone from wherever you may be. It features the very powerful AeroForce vacuuming system and an AeroForce High Efficiency filter. It uses debris extractors instead of a bristle brush to grab and break down dirt and debris eliminating hair tangles and jams. It comes with Dual Mode Virtual Mode Barriers which can be used to prevent the robot from entering rooms or restricted areas that are not supposed to be cleaned. ​It features the special carpet boost mode which detects when the robot is working on carpets and boosts automatically the suction power. It has a full bin indicator. With a full battery, it can vacuum for a longer period of time than ILIFE A8 can. It is equipped with the powerful Gen 3 CyclonePower suction system. It gives you the option of using either a bristle main brush which is good for carpets, or a rubber main brush which is great for hard floors and tangle free pet hair collection. Its suction power can be increased by selecting the max mode to enjoy a super-powered clean with maximum pickup. It uses a HEPA style filter. Though it can not be controlled using your smartphone (since it does not support Wi-Fi), it does come with a remote-control device. It costs quite a bit less than the Roomba 980. ​Note: If Wi-Fi support, which enables smartphone control of your robot, is important to you, and if you're looking for a robot that costs less than Roomba 980, you might want to consider other Wi-Fi supporting Roomba vacuuming robots made by iRobot. For a comparison of all Wi-Fi supporting Roomba robots made by iRobot, please click: Comparing All Wi-Fi Supporting Roomba Vacuuming Robots.